First there was the scout. He (she? I cant tell the youngsters apart) was gobbling ( yes, I did say that) up the fallen sunflower seeds. Seemed a bit spooky so I was very still there by the window. Next thing I know, the whole bunch is there, and they seemed oblivious to my presence. I made lots of noise, even vacuumed, and they were not phased. They hung out there at the feeder about an hour or more. The only tiny bird who dared to join them were the brave little chickadees, who fearlessly flitted in and out, grabbing their seeds, and then coming back for more. Sometimes, the day is full of small tasks. They have to get done but there is not much excitement in writing about them. Folding laundry, bringing in firewoood, cleaning up, working on a small improvement project, going to the dump and recycling center, dropping by the town barn to fill a couple of buckets with sand, picking up a few items at the local organic market, cooking the veggie scraps into broth- these were the things that occupied my day today. Nothing earth shattering. Yet, somehow, safisfying. Completing the small tasks brings a certain sense of accomplishment, even if it is just the stuff of everyday life. There are many days like this. Most days, actually. Maybe we think every day needs to be a ten on the scale.... full of greatness, or excitement, or something to mark it as "special". I think a "5"day is just fine. Average, ordinary, good. Tomorrow, when I have some nice veggie broth to cook the rice in, I will appreciate the ordinary day that produced it. Abraham Lincoln is quoted as saying, "Most people are about as happy as they want to be." Do you think that's true? I choose to be happy with my average day, and thankful that I have the health, liberty, and means to be right here, right now. 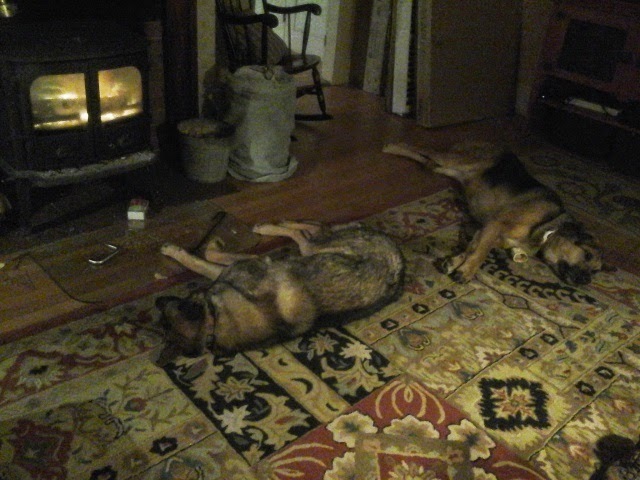 The dogs seem pretty satisfied too. Weather Today: was about 5 degrees this morning, gray, and a dusting of snow. Wildlife: well, you saw them. Training. Planks, and upper body strength. Psalm 90:12 Lord, teach us to number our days, that we may gain a heart of wisdom.